On a recent trip to the post office, I was delighted to discover that a pane of historic U.S. flags is being issued on Flag Day - June 14. 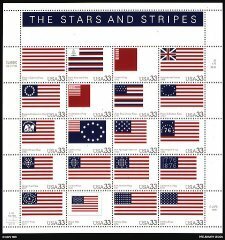 The Stars and Stripes This stamp pane pays tribute to the American flag and its unique history. Composed of 20 different flags, the pane loosely charts the evolution of the Stars and Stripes from colonial times to the present. Among the flags displayed are the Continental Colors and the Star-Spangled Banner, in addition to many regional and military flags. 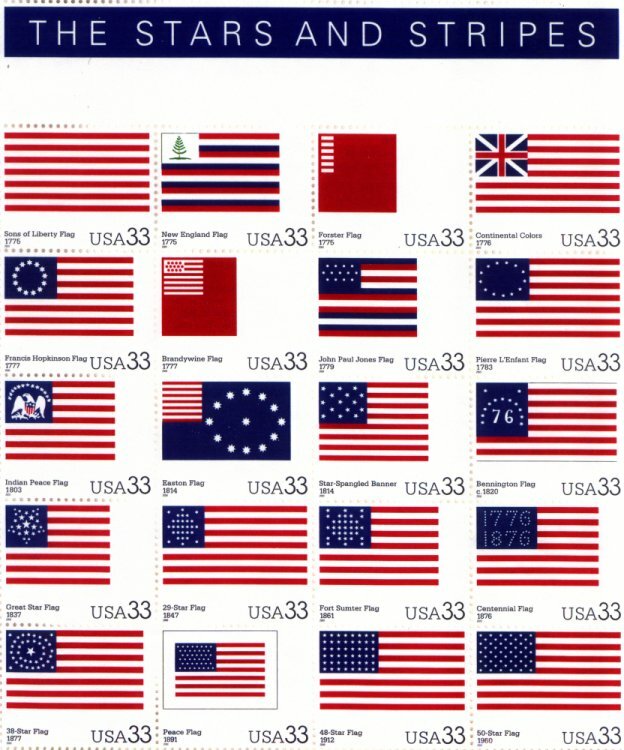 These flags were selected for their significance in American history as well as for their aesthetic value. The beauty of the stamp pane is based on the diversity of the designs combined with the theme of red, white and blue. In order to achieve visual continuity, the red and blue colors were standardized.